​​ AUSTIN – In October 2017, the board of trustees at St. Edward’s University approved its Strategic Plan 2022, a 15- to 20-year blueprint for how to accommodate its growth. 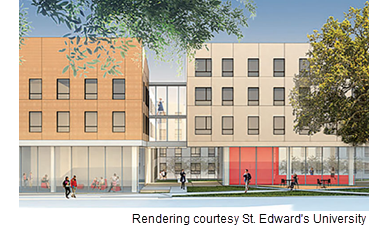 Since then, the university has completed exterior renovations of its main building and begun construction on its new, 133-unit Pavilions apartment complex, which is expected to open in time for the 2018 fall semester. There are 1,400 beds for students, which is fewer than the 2,000 requests for on-campus housing the university typically receives each year. Upcoming projects under the master plan include the building of a recreation and convocation center, the first phase of which is scheduled to be complete by fall 2019.